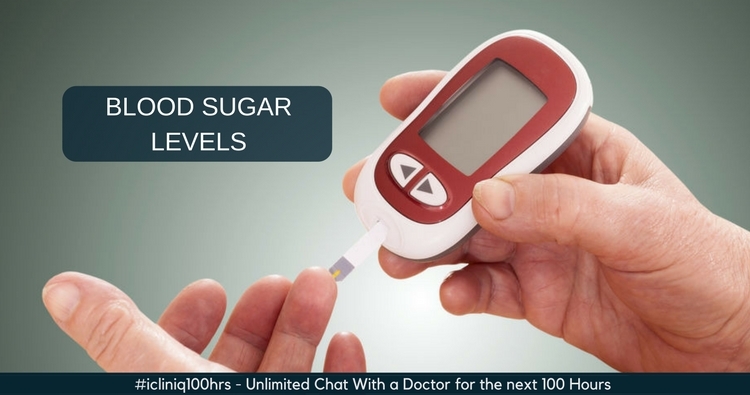 iCliniq › Ask a doctor online › Answers › Diabetology › Uncontrolled Diabetes › Please help me lower my blood sugar levels. Q. Please help me lower my blood sugar levels. I have diabetes since the last 11 to 12 years, and I started taking medicines given by my family doctor. Presently, I am taking Glimisave M2 (one tablet in the morning and evening), Dynaglipt 20 (one tablet in the morning), and Absolut 3G (one in the evening). My health is fine, and I do not have any other diseases. Recently, my blood sugar level showed up high, so my family doctor advised me to consult a diabetologist to control blood sugar level. Please help me. I have attached my test reports. • What can be done for sudden chest and back pain? I just read your query about your high blood sugar levels and from the lab results (attachment removed to protect patient identity), it appears that you have uncontrolled diabetes and dyslipidemia, that is, high cholesterol. According to your HbA1C, it is recommended that you start Insulin glargine pen, once daily at bedtime. 6 units initially, and then monitor your fasting blood sugar, your 2-hour post meals blood sugar, and before bedtime blood sugar levels for three days after starting Insulin. According to the results, we can slowly increase or decrease the dose. Although there is an option of starting tablet Metformin, since your creatinine is a bit on the upper normal, it is not recommended. You will need to learn the technique to use Insulin from a local doctor. Repeat your HbA1C after three months, and then we can see what more is needed. In the meantime, try to take a low-carbohydrate and low-fat diet. Drink 8 to 10 glasses of water daily. Try to walk 30 minutes daily. Since you have high cholesterol levels, I suggest that you try tablet Simvastatin 20 mg at bedtime daily for six months. We will repeat your lipid profile after three months again. Do let me know if you need assistance or if you do not understand anything. Hope you find my advice of some benefit. Good luck. My father, when he was 72 years old, his fasting blood sugar level was 474 and PP was above 700. But still, the doctor suggested him a tablet and not Insulin. And he was not even admitted to any hospital. Now, he is 76 years old, and he is fine and his blood sugar level is below 150. In view of this, I request you to suggest a tablet instead of Insulin. I will try to control the same in future by exercise as suggested by you. You can try this for three months only. Recheck your HbA1C and creatinine, and then get back. If high, then discontinue this and start Insulin as mentioned. Tablet Metformin 500 mg in addition to your other diabetes medications. Tablet Simvastatin 20 mg at bedtime daily. Consult your specialist doctor, discuss with him or her and start taking the medicines after their consent.